TOKYO, Japan, and HSINCHU, Taiwan, May 17, 2011 - E Ink Holdings Inc. and Seiko Epson Corporation ("Epson") today announced the joint development of a 300-dpi electronic paper device with razor-sharp text and images for ePaper Document Readers. Combining E Ink's high-resolution ePaper display and Epson's high-speed display controller platform, the new device will enable the world's highest resolution ePaper tablets. With sharply improved readability and ease-of-use the ePaper Document Reader is expected to catch on in business and education settings where huge amounts of data have to be processed, as well as in countries that use character-based text, including Japan and China. Thin, lightweight, energy-efficient eReaders with easy-to-read, paper-like displays have won over consumers, who are snapping up ePaper devices in unprecedented numbers, causing the market to surge. Demand has also been on the rise in business and education, market segments that require exactly what ePaper provides: the fast and accurate display of enormous amounts of information. Applications in these segments demand higher resolution than that offered by today's 160-dpi displays due to the need to crisply render, with smooth gradations, engineering diagrams, illustrations, Asian characters, and other fine or intricate content. These market segments also demand faster page navigation and sophisticated user interfaces to allow instant viewing of vast amounts of data. "As the adoption of eReaders continues to rise worldwide, the opportunities for our EPD technology are expanding in new market segments including business and education," said Scott Liu, chairman of E Ink. "We continue to improve E Ink's technology to meet the demands of our customers and the needs of consumers, and this new EPD delivers the low power, sunlight readability and thin, lightweight form factor users have come to expect from E Ink at an even higher resolution." "We developed this device specifically to meet the high data demands of business and academia," said Torao Yajima, managing director at Epson. "Our IC controller and processing power enables the display to handle large files while maintaining the excellent display control and operability found in today's EPDs, including fast page navigation and a sophisticated user interface." Epson's high speed controller platform is an ideal choice for developers who wish to develop high resolution eTablets with ease and within a very short period. 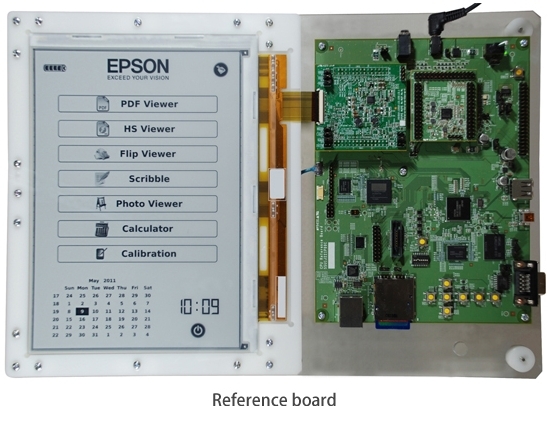 The respective roles of E Ink and Epson and the products they offer are described below. E Ink will manufacture, sell and support the newly developed 300-dpi ePaper displays, which measure 9.68 inches on the diagonal and have 2,400 x 1,650 pixels. These paper-like, high-resolution displays demonstrate in full the very best features of ePaper: crisp and clear text and images on an easy-on-the-eyes screen, a thin and light form factor, and ultra-low power consumption. Epson will manufacture, sell and support a high-resolution, high-speed display controller platform optimized for controlling E Ink's high-resolution display. Leveraging Epson's experience with image processing technology developed for photo-quality printers, the display controller platform combines a display controller IC, applications processor, system power management IC, and firmware to provide excellent display control and improved operability. Moving forward, E Ink and Epson plan to continue collaborating to promote the popularization of ePaper based devices in the business and education markets by developing technology, expanding and upgrading the product lineup, and providing customer support. The jointly developed device will be on display at the E Ink booth at SID, to be held in Los Angeles from May 15 to 20.